Trevor Timm of the Freedom of the Press Foundation tweeted: “[Rep. Adam Schiff (D-Calif.)] was *just* on the Sunday shows claiming Trump was misusing the Justice Dept. to go over his enemies. But plans on voting to extend FBI/NSA surveillance powers.” Timm notes that Rep Nancy Pelosi (D-Calif.) has been silent on the matter. Landale is with X-Lab. He said today: “One overlooked aspect of the debate is that people who began using Tor or VPNs in large numbers after Congress voted to allow Internet Service Providers to sell their browsing history to advertisers are likely being targeted under Section 702 — and that’s just one of the loopholes NSA uses to turn this authority inward to spy on Americans. 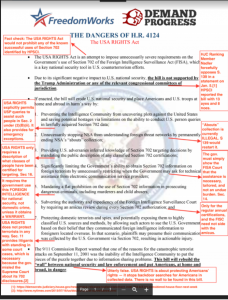 He notes that Demand Progress and FreedomWorks “put together a rebuttal of the House Permanent Select Committee on Intelligence’s one-pager on the USA RIGHTS Act, which is being offered as an amendment to the 702 expansion bill” — see it here.